disturbance of the white substance of the brain. See also adrenoleukodystrophy and leukoencephalopathy. metachromatic leukodystrophy a hereditary leukoencephalopathy, marked by accumulation of a sphingolipid (sulfatide) in tissues, with diffuse loss of myelin in the central nervous system and progressive dementia and paralysis; classified according to age of onset as infantile, juvenile, and adult. Term for a group of white matter diseases, some familial, characterized by progressive cerebral deterioration usually in early life, and pathologically by primary absence or degeneration of the myelin of the central and peripheral nervous systems with glial reaction; probably related to a defect in lipid metabolism; most leukodystrophies are autosomal recessive, several are X-linked recessive, and a few are autosomal dominant. /leu·ko·dys·tro·phy/ (-dis´trah-fe) disturbance of the white substance of the brain; see also leukoencephalopathy. globoid cell leukodystrophy Krabbe's disease. hereditary adult-onset leukodystrophy an inherited leukoencephalopathy characterized by progressive degeneration of the white matter, with motor disturbances, bowel and bladder incontinence, and orthostatic hypotension. metachromatic leukodystrophy an inherited disorder due to accumulation of sulfatide in tissues with a diffuse loss of myelin in the central nervous system; it occurs in several forms, with increasing age of onset correlated to decreasing severity, all initially presenting as mental regression and motor disturbances. Any of various genetic, usually inherited diseases characterized by a defect in the development or maintenance of myelin. 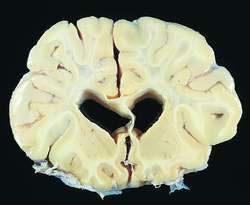 a disease of the white matter of the brain, characterized by demyelination. See also leukoencephalopathy. Neurology A heterogeneous group of disorders of cerebral myelin or its metabolism–eg, Krabbe's disease, metachromatic leukodystrophy, 'sphingolipidoses', that share certain pathological features Clinical 'White matter disease', ie predominantly motor, dominated by progressive paralysis and ataxia rather than dementia. See Globoid cell leukodystrophy. A group of white matter diseases, some familial, characterized by progressive cerebral deterioration in early life and primary absence or degeneration of the myelin of the central and peripheral nervous systems; probably related to a defect in lipid metabolism; the adult type of Pelizaeus-Merzbacher disease is inherited as an autosomal dominant trait. disorders or metabolic defects in the system required for the maintenance and degradation of normally formed myelin in newborn and young animals. Clinical signs begin some time after birth. See also leukoencephalopathy. see hereditary myelopathy of Afghan hounds. a familial, probably inherited, disease of Dalmatian dogs in which there is blindness and progressive motor dysfunction from a few months of age. a familial disease of astrocytes causing ataxia, paresis and behavioral changes from an early age; reported in Labrador retrievers. Similar to Alexander's disease in humans. an inherited lysosomal storage disease of polled Dorset sheep, cats, and dogs, particularly Cairn terriers and West Highland white terriers, caused by a deficiency of the enzyme beta-galactocerebrosidase. From a young age, there is weakness that progresses to paralysis. Called also galactocerebrosidosis and Krabbe's disease. a leukoencephalopathy reported in cats, caused by a deficiency of the enzyme arylsulfatase A. There is accumulation of a sphingolipid (sulfatide) in tissues, with diffuse loss of myelin in the central nervous system and progressive neurological dysfunction. The mean age at onset of leukodystrophy is about 27 years old, ranging from 14 to 44 years. Sulfatide levels correlate with severity of neuropathy in metachromatic leukodystrophy. The report provides comprehensive information on the therapeutics under development for Metachromatic Leukodystrophy (MLD), complete with analysis by stage of development, drug target, mechanism of action (MoA), route of administration (RoA) and molecule type. Dominantly-inherited adult-onset leukodystrophy with palatal tremor caused by a mutation in the glial fibrillary acidic protein gene. Psychiatric disturbances in metachromatic leukodystrophy. com/apromiseforzach to highlight screening for Krabbe Leukodystrophy - a rare terminal disease affecting his nervous system. The aggressive condition is a form of Leukodystrophy and means that they don't develop enough Myelin Enzyme, the protective sheath that protects the nerves - leading to severe degeneration of motor skills and life expectancy. Even as a relative youngster at 23 himself, he is committed to helping disadvantaged kids as an ambassador for the European Leukodystrophy Association (ELA), which fights against a genetic disorder, and for its partner organisation Face Au Monde (Facing The World). I'm all the more conscious of it as my brother lives with a handicap so getting involved with ELA (European Leukodystrophy Association) seemed natural. Climb will donate all of the challenge's proceeds to benefit scientific research for the 34 different types of leukodystrophy. It includes Krabbe disease (KD) or globoid cell leukodystrophy (GLD), Canavan disease, Pelizaeus-Merzbacher disease and Alexander disease. Childhood ataxia with CNS hypomyelination/vanishing white matter disease -A common leukodystrophy caused by abnormal control of protein synthesis.